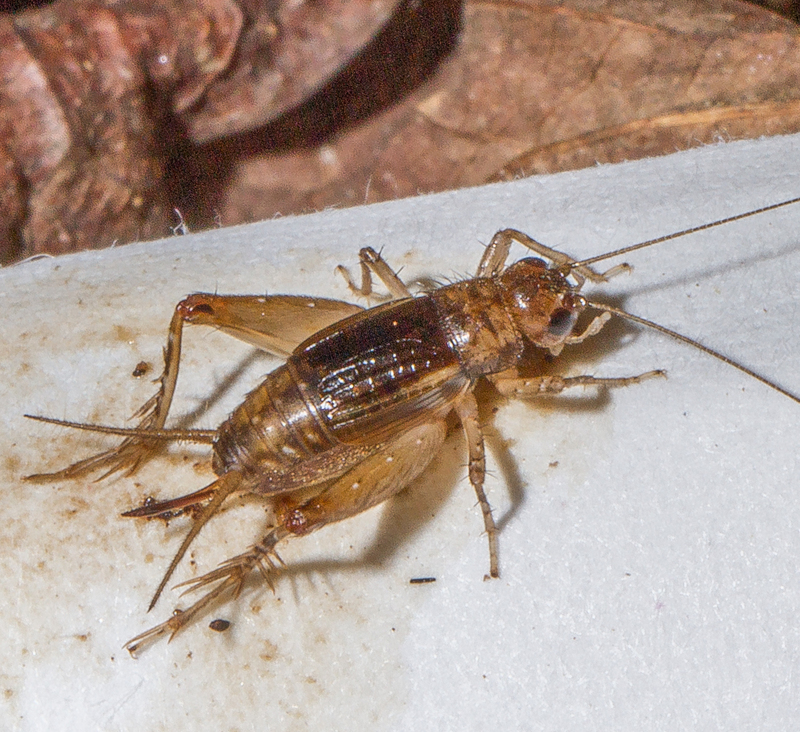 Comments: A small, yellowish-brown ground cricket. 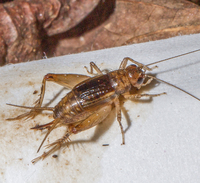 The pale palps serve to distinguish this species from all other of our ground crickets except for Eunemobius confusus and melodius. The palps of confusus are a much purer white than those of carolinus and its coloration is much darker. Carolinus cannot be distinguished from melodius, however, based on coloration, but th two differ in terms of song, number of teeth on the stridulatory veins in the males, or on the lengths of the ovipositors in the females (Thomas and Alexander, 1957). Structural Features: Members of Eunemobius can be distinguished from Allonemobius and Neonemobius by their possession of equal length ventral spurs on the hind tibiae and by ovipositors that have serrulations on the ventral margin of the tip (smooth in the other genera) and coarse teeth on the dorsal margin (finely serrulate in the other genera) (Hebard, 1913; SINA, 2017). Females can be distinguished from E. melodius by their shorter ovipostors, 2.6-3.1 mm in carolinus versus 4.7-5.4 mm in melodius (Thomas and Alexander, 1957). Males can be distinguished by their smaller number of stridulatory pegs -- 51-63 in carolinus versus 110-125 in melodius. Thomas and Alexander also note that the pegs in carolinus do not reach the ulnar vein whereas they extend beyond it in melodius. Singing Behavior: Songs consist of continuous, somewhat buzzy trills. 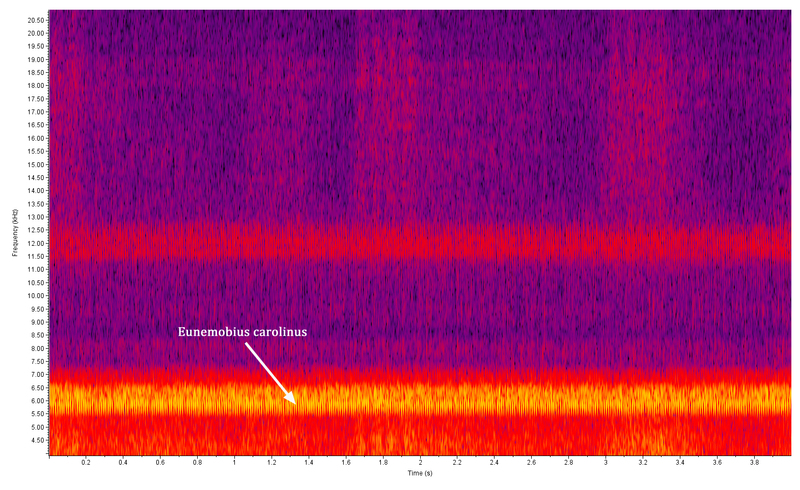 The most characteristic feature is variability of both amplitude -- with the trills getting louder or softer -- and in beat, with some sections of a song showing a strong, pulsing rhythm similar to that of maculatus and other sections without any obvious beat. At 76 F (= 24.5 C), the dominant pitch is about 6.1 kHz with a pulse rate of 76-82 pulses per second (SINA). Habitats: Fulton (1931) describes carolinus as occurring in a wide variety of habitats but usually where the soil moisture is fairly high. These include riparian, bottomland, and mesic hardwoods; marshes; and bogs. Observation Methods: Most easily detected by song. Comes at least occasionally to lights, especially macropterous forms. Comments: Eunemobius carolina is one of our most widespread and most often encountered species. It occupies a wide range of habitats, including suburban areas, and seems to be fairly secure within the state. 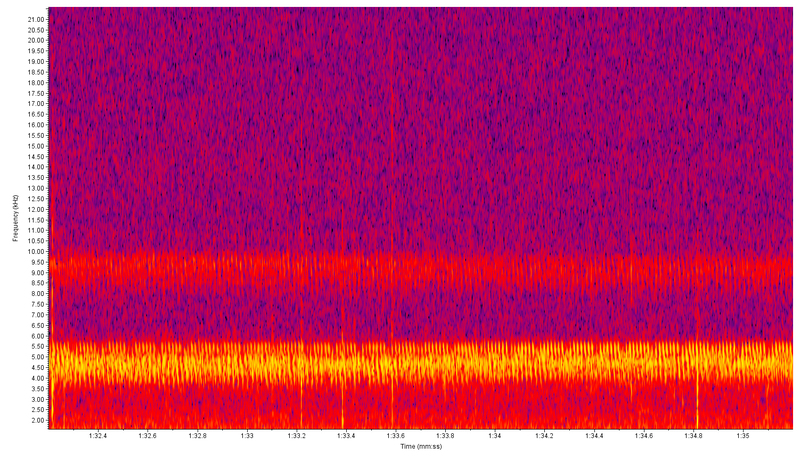 Comment: Singing on the ground at 21:50, ~74 F. ~80 pulses/sec.